[P] Shadow Steal: 10+ damage. Does 10 damage plus 20 more damage for each Special Energy card in you opponent's discard pile. [P][C] Darkness Chant. 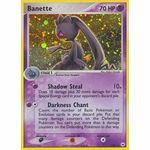 Count the number of Basic Pokemon or Evolution cards in your discard pile. Put that many damage counters on the Defending Pokemon. You can't put more than 6 damage counters on the Defending Pokemon in this way. Poke-Body: Primal Pull. 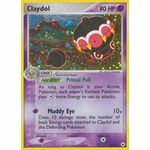 As long a Claydol is your Active Pokemon, each Player's Evolved Pokemon pays [C] more Energy to use its attacks. [P] Muddy Eye: 10x damage. 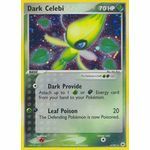 Does 10 damage times the number of basic Energy cards attached to Claydol and the Defending Pokemon. [C] Flutter Trick: 20 damage. Flip a coin. If heads, look at your opponent's hand and choose 1 cards. Your opponent discards the card you chose. [G][C] Triple Poison: 10 damage. The Defending Pokemon is now Poisoned. Put 3 damage counters instead of 1 on the Defending Pokemon between turns. This Pokemon is both [G][D] type. [C] Dark Provide. 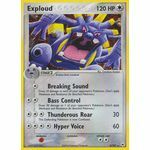 Attach up to 1 [G] or [D] Energy cards from your hand to your Pokemon. [G][D] Leaf Poison: 20 damage. The Defending Pokemon is now Poisoned. [L] Swift: 30 damage. 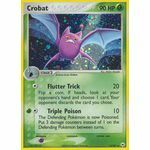 This attack's damage isn't affected by Weakness, Resistance, Poke-Powers, Poke-Bodies, or any other effects on the Defending Pokemon. [C][C][C] Mass Destruction. Both Electrode and the Defending Pokemon are now Knocked Out. 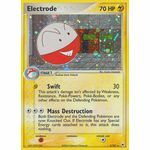 If Electrode has any Special Energy cards attached to it, this attack does nothing. [C][C][C] Thunderous Roar: 30 damage. The Defending Pokemon is now Confused. [C][C][C][C] Hyper Voice: 60 damage.